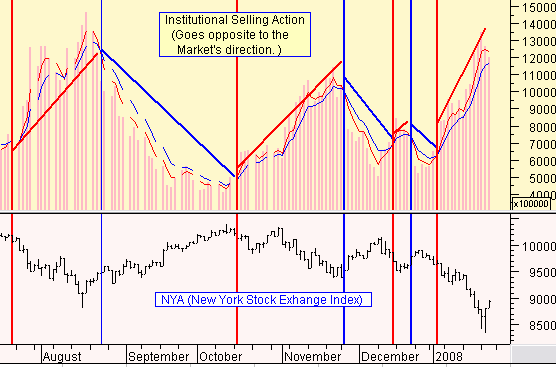 Today's chart is below, and it shows the periods when Institutional Selling was trending UP, or trending DOWN. (Be aware, that Institutional Selling trends move opposite to the market's movement.) If Selling is trending up, then the market moves down. If Selling is trending down (decreasing), then the market moves up. This happens because Institutions are responsible for over 50% of the stock market's trading volume. Current Update : On January 3rd, the trend of Institutional Selling shifted up , and the market lost its ability to move up any further ... and started a downtrend as seen on the chart. The Institutional Selling trend has remained in an up trend since January 3rd ., therefore the market has been moving down. If you look at the rose colored bars, the Institutional Selling has lessened in the past two days ... but not yet enough to reverse the Selling into a down trend. What it does in the next two to three trading days will be an important event for our subscribers to watch for. If you find this kind of data empowering and important relative to understanding where the market truly is , then why not consider joining us as one of our paid subscribers?